I live in a unique community that has golf cart paths all throughout the city. We moved here specifically for this reason. After I lost my driver’s license due to my vision impairment, my husband and I discovered Peachtree City, Georgia where there are over 100 miles of scenic cart/biking paths connecting the city. I was able to drive our golf cart to get around town and run family errands for the next ten years. Eventually, our three children learned to drive the golf cart and they became my chauffeurs. It was a perfect solution to our situation and a very enjoyable lifestyle. I no longer have enough vision to drive the golf cart, but it was a blast while it lasted! Most families own a golf cart to get around town easily and as a fun way to travel. On a recent Saturday, my friend invited me to go to a concert at the local amphitheater. “Let’s take my golf cart, ” I said. That night, we packed a small cooler of refreshments and headed down the path. My friend, of course was driving and we were quickly engrossed in deep conversation because we had not seen each other in quite a while. We stopped off and had a quick bite to eat at a sandwich shop. Then back on the golf cart once again, we headed to the concert. As we were riding along, I noticed a blanket and a jacket on the cart that didn’t seem familiar. “What’s this?” I asked Suzanne. “Oh, your husband must have put them on the golf cart for us,” she remarked. Within moments of our discovery, a golf cart full of people who looked vaguely familiar from the sandwich shop, pulled up behind us and said “Ah ha! We found you!” Indeed, they were driving MY golf cart which was very similar to theirs-same make but a slightly darker blue color. Someone at the sandwich shop told them they saw “a blind lady and a blond lady get on their cart and they were talking about going to the concert.” So they all piled on my golf cart and came looking for us. They too were attending the concert. As it turned out, we knew these folks; their kids went to school with our kids and one of them works with my husband. Oh we all had such a great laugh together! Then we took photos and texted our children to tell them what happened. It was a unique set of circumstances which made such an adventure possible. 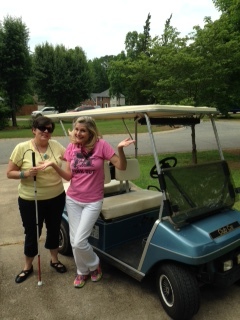 We made jokes about “the blond lady leading the blind lady” and how this could only happen in Peachtree City. We swapped carts and grabbed our coolers, still laughing as we entered the concert. By the way, golf cart keys work interchangeably in carts of the same model! Who knew?